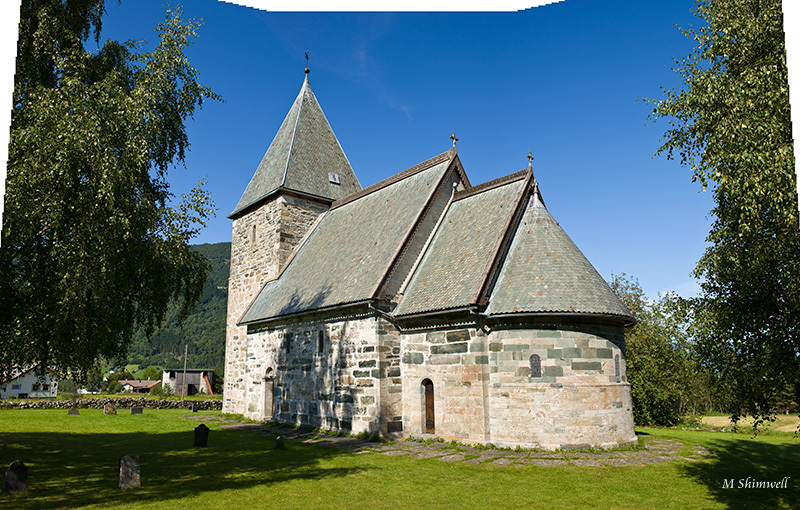 The small town of Vik, on the bank of Sognefjord has two ancient churches. A stave church and the stone church. 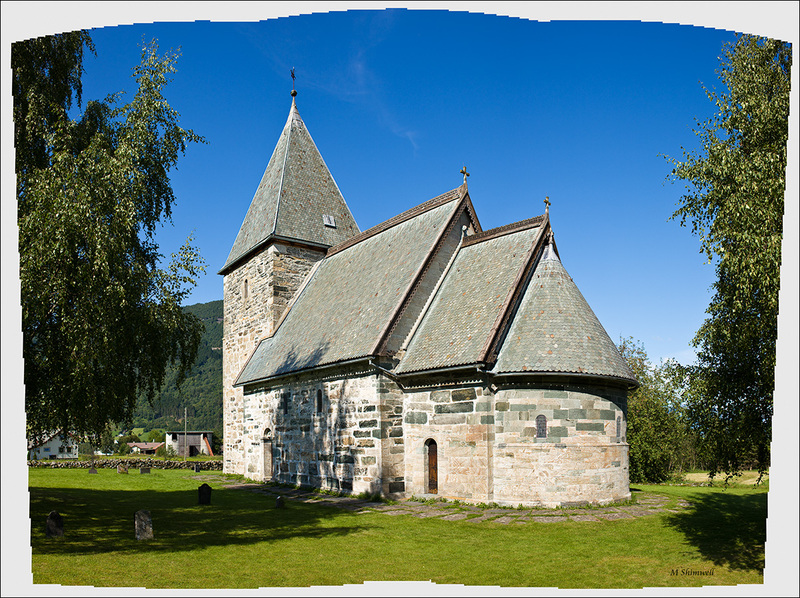 This is a 3 shot pano of the stone church - I've a more complex pano to assemble of the interior of the stave church later. IIRC both churches were 'saved', and the stave church at least rebuilt here, by an 18th or 19th century architect. 3 shots, 1Ds3 and ZF35. Handheld as we were moving on by now and the children had had enough of the tripod at the stave church! The original prints 29 by 18.5 at 300ppi, and looking at it I should probably correct the converging verticals before I epend paper on it! There's something organic about the picture as you have it with the upper and lateral edges being rough remnants of the panoramic procedure. I also might like the church as it is with its distortions, but it would be great to see if this holds up when you post the corrected version. Asher, I've now re-stitched using a cylyindrical projection and with a very minor perspective tweak have come up with this. Also a bit of local sharpening and slight curves and colour/lightness adjustments. Cooments are very elome, and I'm interested in reactions to the organic form above compared to the more 'correct' version below. With the formation of the Panorama Photography Forum, this thread addresses a special quality of such photography which might well be viewed as an asset. This stitched photograph of a church is a perfect example of the value of stitching to extend the view of a great landscape scene that might be hard to get in with a normal view. The irregular edges add something organic to the image and points to the presence of human effort and devotion in making this picture. This is commendable as an approach. One can just carry one lens and then work to follow one's mind's vision. In other words we can see through the mind and not mrely what the lens can see. really beautiful colors and composition! I also might like the church as it is with its distortions, but it would be great to see if this holds up when you post the corrected version. Indeed, it isn't alway necessary or even beneficial to totally correct for keystoning. It is rather easy in most stitchers to try out several different degrees of correction for the output. It usually requires nothing more than placing the horizon or vanishing point at a different vertical position ("pitch"), and generating a new preview or output file. It also depends on the chosen projection method, some don't produce straight lines anyway. Especially a close up of tall buildings with a rectilinear projection can sometimes benefit from placing the assumed horizon a bit above the actual one. sorry if there is something wrong with this - I know it is your photo and just trying to correct some perspective on your picture - I think. I used PTGUI to add some verticals and after horizontal alignment a little photoshopping. a freeware with similar results is hugin. No problem at all - I have started on a similar correction myself using PS, but should probably take the time to learn PTGUI or HUGIN. I'm glad you liked the image - I really didn't have much work to do once out of the raw converter. In my version I have added a little sharpening to the stonework, but not much as I didn't want it to look too 'crispy'. I have to say that I really enjoy panoramas and should spend some time working on my raw files as I've a efw awaiting assembly.